Momentous Musicals premiered at the Wimbledon theatre in mid 2012 and will be returning to the theatre again this month prior to a UK Tour. 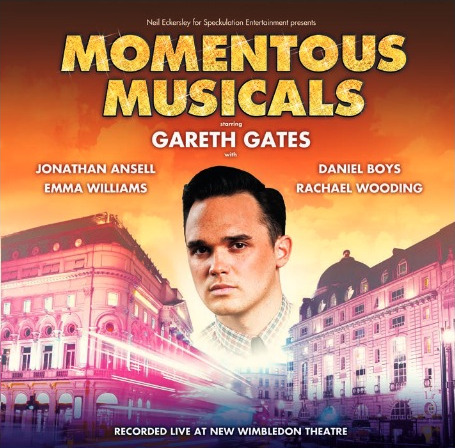 The show brings together the musical talent of Gareth Gates (who headlines the event), Rachael Wooding, Daniel Boys, Emma Williams and Jonathan Ansell. The CD starts off with the wonderful Rachael Wooding singing One Night Only, what a fantastic opening for the recording. Rachael has a lovely tone to her voice with great power behind it and she sings the song with so much umph! The moment I listened to this track I was drawn in immediately by the brilliant orchestration at the start, a similar moment happened when I listened to Mein Hier sung by Emma Williams. Rachael has an amazing energy in her voice and just by listening to the recording you can tell it would have been a brilliant opening to the show. After the high energy opening track we then get to hear the wonderful Daniel Boys sing Maria, such breathtaking control in his voice. It’s beautiful to listen to and you really get drawn into his vocals, even though you’re just listening to it you can really feel the emotion through the vocals. The headliner of the show, Gareth Gates, then pops out a great rendition of Close Every Door to Me. Bringing it back to where he made his West End debut you can tell the song means a lot to him and his vocals are impeccable. Rachael Wooding is then brought back with Emma Williams to sing the classic I Know Him So Well. The pair are totally in-sync with each other and provide a beautiful and perfectly sung rendition of the song, this number could have been very cheesy and over done but they seem to have gotten it just right. Love Changes Everything is the next track, sung by Jonathan Ansell. Although this is one of the weaker songs of the bunch he proves that he’s not just that one from G4. Fabulous power and some great moments within the number. Rachael Wooding is next again with yet another song, this is by no means a bad thing as you do not get bored of her voice. She features a lot on this album but it is much deserved, she really shows great versatility on the album. She sings You Must Love Me from Evita very simply but its so effective. Its a perfect example that if your strip back a song it can be astounding. One of the highlights of the CD. Next, we move onto Mein Herr which has to be one of the best musically directed numbers I have ever heard! George Dyer leads the band and he does an incredible job. The album really owes a lot to him because the quality of it would not be the same with out him. Emma Williams is astonishing on this track too, she really shows how versatile she can be and I am dying to see her as Sally Bowles after hearing this and I’m sure you will be to! We then get to hear a rendition of a more modern musical, So Much Better from Legally Blonde. Sung by Rachael Wooding she shows exactly why she should be the next Elle Woods! The tones of her voice are so rich that she really could sing anything and it would be amazing. Gareth then returns to sing Empty Chairs at Empty Tables, his voice just shouts musical theatre and what I love with this song is that doesn’t over do it, if you ever want any tips on how to sing musical theatre then I would recommend listening to him. Hushabye Mountain is an unexpected addition to the album but Emma Williams sings it with such beauty, its like a bed time lullaby. Not that its so boring that it would put you to sleep but thats its so beautiful and peaceful. Its a shame that Daniel Boys is featured only twice on the album because he performs amazingly, but his second and final number on the CD is Being Alive, I must say that I am not the biggest fan of this song. To me its very over done by average singers at things like this but Daniel, again, shows such control within his voice and this is definitely one of the strongest performances on the Album. Gareth Gates sings Why, God, Why? from Miss Saigon next on the album, I really like his version of the song. Theres something about his voice that brings a whole new meaning to the song for me, its really nicely sung and fits him really well. Jonathan Asnell then sings Gethsemane which, again, isn’t as strong as you’d like it to be but he sings it really well and just by listening to it you can really imagine him performing it. I can imagine it being amazing to hear it live. No One But You (Only the Good Die Young) is the next song to be sung on the album, by the wonderful Rachael Wooding. All I can say about this is that it definitely is one of the best renditions of the song I have ever heard. Enough Said! The albums last track is For Good from Wicked, I found it a little odd that its been sun by Rachael Wooding and Gareth Gates as its a female duet but it still worked. I’m not a fan of using this song outside of Wicked because it gets a little cringe worthy and it is a little on the album but then you can’t have a musical theatre album with out a little bit of cheese! And the fact its sung so well over shadows the cheesesyness. I wish there were more modern musical theatre songs on the album, it would have been nice if they weren’t so safe with their song choices. If you were putting together a musical theatre song show these would be the first songs that would come to mind and they could have been really cheesy but the quality of them is fantastic. I hate musical theatre compilation albums as they tend to be badly put together with awful orchestrations and not very well sung but this is the complete opposite. I would totally recommend you getting this album as it has to be one of the best Musical Theatre Compilation albums out there, the fact that its been recorded live is also very impressive as the vocals are perfect! Cast Includes: Gareth Gates, Rachael Wooding, Emma Williams, Daniel Boys and Jonathan Asnell.